Lyman Hall was one of three Georgians to sign the Declaration of Independence in 1776. Three years later Hall's family had to flee their home when the British burned the town of Sunbury, where it was located, to the ground. Lyman Hall was a physician and clergyman. After serving in the Continental Congress, he returned home to Georgia where he was elected Governor. Once his term as Governor of Georgia came to an end, he resumed his medical practice. 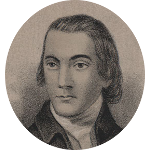 It seems only fitting that a couple of famous kin to Lyman Hall are Revolutionary War patriots William Williams, a fellow signer of the Declaration of Independence, and Joseph Warren, an American general killed at the Battle of Bunker Hill. He also has a royal connection through his kinship to Princess Diana, as well as family connections to Presidents Franklin Roosevelt and Calvin Coolidge. Lyman Hall has a number of literary kin that include Ernest Hemingway, Edgar Rice Burroughs, Robert Frost and Tennessee Williams. Among celebrity kin there is the Wilson brothers, founders of the Beach Boys, actor Humphrey Bogart, actress Katharine Hepburn, and television actors Alec Baldwin and Ted Danson.